It has been an active few weeks here at Falcon Containers. Our VP of Sales, Brian Dieringer, just returned from a comprehensive visit to China to better understand the origination homeland of our fleet of products. In a previous blog post, we shared a TED Ed Video that explained how containerization shaped the modern world. Sir Harold Evans, author of They Made America, walked us through an illustration of globalization and how goods and services are moved around the world today, and how that was implemented through the use of a standard ISO shipping container. These containers take on a journey through their life cycle that often involve multiple countries and the stowage of precious goods and staples. These containers end these journeys in a variety of conditions or ‘Types” as we at Falcon Containers categorize them to be. Our Blog Post from October 18, 2010 outlined our Falcon Container rating scale. I’ll summarize here and you can refer to our post for more information. After a 10-point checklist is completed on any container brought into our sale inventory a Type 1-4 rating is given to the Conex Box. One Tripper- this box is in pristine condition and has experienced one trip from point of origination (i.e. China) to a US port. A few to no dents and no rust are typical. Type 1- a ‘one tripper’ is included in this category and is a minimally used box with no to few dents and minimal if any rust. Type 2 – This is an average box you would find in our fleet of containers and is always certified as wind and watertight. Multiple dents are common as is cosmetic rust on interior or exterior surfaces. Type 3- this box has been ‘around’ and has typically significant wear and tear. Dents or even small hole and extensive surface rust are often common in this type of shipping container. Roof or floor bracing problems are also seen. Type 4- typically not in our inventory and typify a box at the end of it's life cycle with extreme damage and wear and tear. These container types are an example of the length and span of travel these structures have experienced. 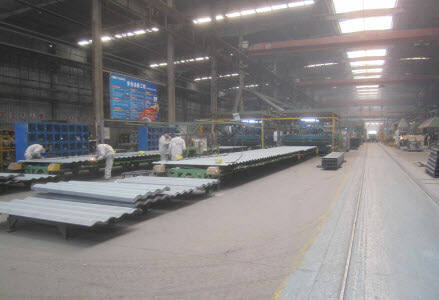 Brian visited a few manufacturers of shipping containers in China, some of which are the largest in the world. We will expand more on his impressions of the country and the experience in future posts and newsletters. This origination point for these structures is one example of the beginning path to the containerization that significantly changed what we have access to in our homelands. This movement of goods world wide and even across our own United States allows our families to experience products and staples from far away foreign countries across the globe.